For thousands of years, starting from petroglyphs and cave paintings all the way to the works of impressionism, the ne art developed as a combination of sophisticated artistic techniques to depict the world around us. This was the case until Kazimir Malevich, a Ukrainian artist, started his own Suprematist revolution bringing art and the artist back to their foundations. Intuition and imagination, as well as perception of a viewer, replaced rigid technicality and realism as the pillars of creativity. The act of creating ceased to be a mere repetition of the environment. The essence of Suprematism is the emergence of something that no one has ever seen before. Malevich has transformed the artist and the viewer into godly creatures, the Creators, capable of not only shaping our world but also creating the new ones. Get your smartphone, take a picture and look at the world of Kazimir Malevich from within. Let’s try to solve the mystery of Suprematism together. We can appreciate its beauty, minimalism and incredible complexity of its eco-system, but more importantly, we can see how the world is built from familiar things and ideas. It is an enchanting kaleidoscope – turn the eyepiece, change your angle and focus and new worlds, solar systems and universes will open up to you. Kazimir Malevich just gave a push. Today, the real Creator of the future is You. Kazimir Malevich remains one of the most important artists of the twentieth-century who fundamentally in uenced the development of ne arts, architecture and design. His works were a watershed in the history of art, separating it into “before” and “after” era. Malevich’s Black Square is one of most renowned paintings in the world alongside Leonardo Da Vinci’s Mona Lisa. Kazimir Malevich became the founding father of Suprematism – unprecedented abstract art re ected in simple geometric forms and primary colors. Malevich thought the artist had to delve inspiration in his own creative self and not merely copy the outside world. Kazimir Malevich was born on February 23 (11), 1879. His was baptised in the Roman Catholic Church of St. Alexander according to the local birth registrar. His father Severyn Malevich (1845-1902) was born in Turbiv in the family of Volyn nobility that traced back its origins to the XVI century. Mother Ludwiga, of the Galynovsky family (1858-1942), was 14 years younger than her husband. Severyn and Ludwiga were married in the same Roman Catholic Church of St. Alexander on February 26, 1878. Kazimir was the rst child who had four brothers and four sisters. Kazimir’s father worked as an administrator on sugar factories and the family often moved from one place to another. Until the age of 17, Malevich lived in di erent towns and villages of Ukraine, such as Yampil, Podolia Governorate, Bilopillia and Parkhomika in the Kharkiv Governorate, and Konotop of Chernihiv Governorate. The artist left lots of autobiographic notes about his Ukrainian childhood. Kazimir Malevich gained his rst art lessons from Ukrainian housewives in the villages, these were lessons in folk art. In 1895-1896, he met with Mykola Murashko and Mykola Pymonenko, rst professional artists in his life. “I am going to Kyiv to see Pymonenko. I was deeply impressed by his paintings. He showed me his Hopak [Ukrainian traditional dance] painting. I was fascinated with everything I saw in his workshop. Countless easels and depictions of Ukrainian life on every painting. The Malevich family moved to Kursk in 1896. Later Kazimir traveled to Moscow to become one of the most active members of the avant-garde movement. In 1915, he draws the iconic Black Square and founds Suprematist current in ne arts. Soon Malevich is invited by Marc Chagall to teach in Vitebsk in 1919 and then goes to lecture in Leningrad. Malevich was a proli c artist until 1926 when the Soviet totalitarian regime started to oppress avant-garde art and eliminate its authors. Those who did not emigrate, committed suicide in labor camps or died of hunger. Malevich was too big to intimidate – he had numerous students and supporters, while the whole world adored his ideas. In the spring of 1927, Malevich went on a trip abroad to show his exhibitions in Warsaw, Berlin and Paris for the only time in his life. Exhibitions in Warsaw and Berlin were a resounding success, but the author was summoned back. He left all of his paintings and materials in Berlin and quickly returned to the Soviet Union to be detained immediately. The dream of an artist about Paris exhibition was not ful lled in his lifetime. Kazimir Malevich visited his parents in Ukraine in the summer of 1927. He met the artists Andriy Taran and Lev Kramarenko, whom he knew before. The artists convinced Ivan Vron, the rector (head) of Kyiv Institute of Art, to write to the People’s Commissar of Education, Mykola Skrypnyk, and get a permission to o er Malevich a job at the Kyiv Institute of Art. Between 1928 and 1930, Kazimir Malevich lectured, arranged workshops of experimental visual arts during which he “cured students from realism and fear of colors,” and advised on teaching methodologies at the Kyiv Institute of Art. Ukrainian leading art publications, such as the Kharkiv futurist journal Nova Generatsiya [New Generation] and Kyiv-based Almanakh-Avanhard [Avant-garde Almanach] published a series of his articles. Yet political climate in Ukraine swiftly changed in 1930. The rector Ivan Vron was red and all of the institute’s progressive sta had quickly followed the suit. In the spring and summer of 1930, Malevich had an individual exhibition of his works in the Kyiv Fine Arts Gallery. This was the last exhibition in the author’s lifetime. In September 1930, Malevich was detained for the second time and spent several months in prison under suspicion of espionage. The jail term caused cancer that led to the death of the artist in his at in Leningrad on May 15, 1935. Kazimir Malevich prepared the scenario of his own funeral in advance and drew his co n in the Suprematist style. He wrote in the testament to bury him under the mighty oak tree in Nemchinovka village, Moscow region, where he loved to walk. The testament stated to plant his favorite owers in the place of his burial and build a vertical arhitekton with a telescope, so that everyone could look at the Jupiter. The whereabouts of the funeral site were lost during the Second World War. In the end of 2015, new documents about Malevich’s period of life in the Soviet Ukraine (1928-1930) were published. The materials were stored in a family archives of the Kropyvnytsky family for over 80 years. This triggered new academic debates on the international conference Kazimir Malevich: Kyiv Aspect on October 6-9, 2016. 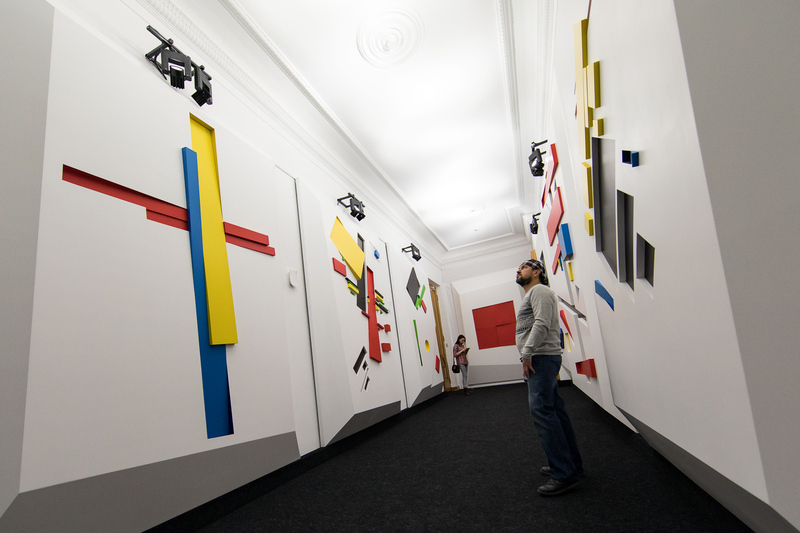 This year, Ukraine inaugurated a new tradition of celebrating Malevich days every year. Currently, Ukraine is moving toward founding the Malevich Institute, which will include a museum, Ukrainian avant-garde research center and laboratory of contemporary art.